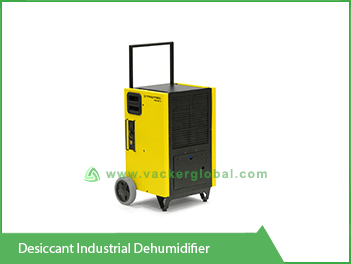 These type is also known as adsorption type dehumidifiers. The technology used in these models is absorbing the moisture content using an adsorbent such as silica gel. 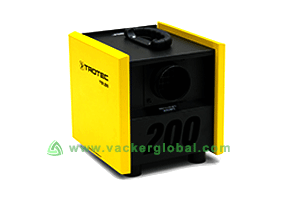 These are very light weight and portable models and are the smallest in the desiccant series. These are equipped with electronic volume control which functions automatically based on the requirement of dry air. A hygrostat controls the machine for setting desired levels of humidity. Typical applications will be small warehouses, cold rooms etc. Total weight is only 9 kg which makes it easy for handling and relocating. A hose can be connected for air output. This model of desiccant dehumidifier is fitted with a radial fan and an additional motor to pump air over long distances. This makes it ideal applications in ship and other marine environments. Marine dehumidifiers require to perform in harsh environments. The air flow over long distance can be connected either to the intake moist air or dry air output simply by changing the internal hose connection. The marine dehumidifier can connect to long distance of flexible hose so that the processed air can be taken to longer distances.